While I love to play Texas Hold ‘Em, real life Poker can become expensive in a hurry. This is where ‘Zynga Poker’ comes in. The game, which started as a Facebook app, was made into an iPhone app following rapid online success. You’re not playing for real money of course, but poker on the go is entertaining. 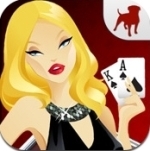 I first downloaded ‘Zynga Poker’ when it came out and was unimpressed, to say the least. The app was slow and buggy, and Zynga’s connection speed wasn’t exactly great. I deleted it just days after I downloaded it. When a friend of mine started playing again, he was able to convince me to give it another go. While it still has some flaws, the current edition is huge improvement over the previous version. The gameplay is smooth and flawless for the most part, and Zynga, the same studio behind ‘Farmville’, was able to piece together some great graphics. The game’s visuals are much better than its Facebook counterpart. The interface is easy to navigate and you are practically guaranteed smooth, uninterrupted play day in and day out. As for flaws, the game has several. ‘Zynga Poker’ crashes almost every time I open it, even though when I open it a second time it works. The game doesn’t crash all that often after I first open it, but when it does it always seems that I might have a good hand. There also seems to be a bug in the sound sometime too, where it doubles up the noises. So when you hear the whoosh of someone folding, you actually get two whooshes in a row. Doesn’t sound like a big deal? The skewed audio can be pretty deceiving. Players have two options for competition. One is to play in a tournament with eight or nine people, the other is to just play tables with different blind amounts. And while you’ll find skilled and poor players in every game, the really bad ones navigate near the bottom of the ‘Zynga Poker’ food chain. 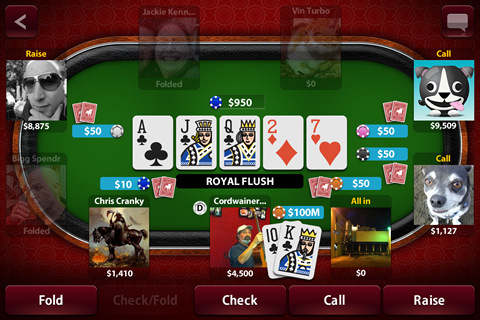 Overall, if you like to play Texas Hold ‘Em on the go, I doubt you’ll be able to find a better poker application than ‘Zygna Poker’. The Texas Hold ‘Em experience is fun, free, and you can play with friends and strangers alike. It’s not perfect by any means, but it’s pretty good. If you haven’t tried it, I don’t know what you’re waiting for.